VE3SP.COM Andre Vanier Toronto – VE3WZW Andre Vanier | HAM Radio | Amateur Radio: Anderson PowerPoles . . . "The 12-volt Connection of Choice! Anderson PowerPoles . . . "The 12-volt Connection of Choice! Anderson PowerPoles . . . "The 12-volt Connection of Choice!" The recommended configuration is shown above. We recommends that the housings should be mated according to the diagram above, viewing from the contact side (opposite the wire side), tongue down, hood up, RED on the LEFT, BLACK on the RIGHT. See the picture above. Don’t mess this up. Wiring your connectors backwards may not cause you a problem but if you take your equipment to use on someone else’s power source, you’ll burn it up! You could also burn THEIR equipment up!PowerWerx supplies a 3/32-inch-diameter roll pin, 1/4 inch long, to keep the housings from sliding apart. Sometimes the roll pin will not fit snug in the hole formed by the two connector halves. A small drop of super glue placed in the hole with the roll pin after it is inserted will insure that the two halves are locked together preventing any accidental reversed polarity and resulting damage of equipment.Be sure to assemble all of the connector bodies as shown to insure proper polarity and compatibility with others in the group. 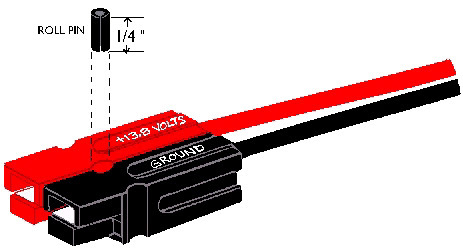 If you take the time to pre-assemble the connector bodies per the pictorial above, as you receive your shipment, you will find it much easier to assemble the connectors for use.